It’s that time of the year again, when people guess what’s happening this year in Dubai’s real estate market. Dubai’s property market has always been the foundation of the city’s success. Despite a period of instability in the past few years, Dubai’s property market remains an important part of the city’s wealth and will continue to generate success for buyers, investors and all those involved. But before discussing 2019, let’s have a quick look at last year’s property market. Dubai’s property market in 2018 has witnessed some major changes that included new laws and regulations such as VAT, long-term visas for investors and also amazing projects launches with even better initiatives that came with these project launches. Another highlight of 2018 was the intense competition between developers which benefited investors and end-user buyers as they benefited from great prices with easy payment plans, outstanding communities and unique projects that stood-out. The city overall has achieved so much in 2018 with its high-quality infrastructure and with the development of a number of new communities offering its residents a wide range of luxurious yet affordable projects to choose from. As seen in 2018, rental and sales prices have matured in 2019, you cannot expect great capital appreciation in very short time like buyers used to expect 15 years ago as the market is getting more stable. While this might not be the perfect market for those looking to immediately flip their property, it is indeed great market for investors and end-users as they could be assured of getting great returns in the long run if they invest in great locations such as Dubai South which is right next to Expo 2020 or Dubai Creek Harbour which will be the heart of Dubai's new vision. Though the figures suggest that the prices might drop in 2019, the price changes are expected to be minor and are expected to last only for the first 2 quarters. So it is fair to say that the first 2 quarters will be favorable to investors and tenants, as they will benefit from lower prices. In addition, lower prices will introduce more end-user buyers to the market and the 10 year residency visa could give qualified residents a sense of stability and will for sure increase property investments. Intense competition between developers will also translate to attractive prices and appealing post-handover payment plans for off-plan projects which will increase number of investors and will most likely introduce more first time investors to the market. In order to maintain supply and demand stability, in 2019 we expect developers to be more creative and to launch attractive projects to attract more buyers. Foreign investors will also continue to be big part of Dubai’s real estate market with China and India expected to top the charts as top foreign investors in Dubai. The real estate market in Dubai is currently in a period of maturity and is showing a sense of stability, especially with Expo 2020 getting closer which is expected to have a positive impact on Dubai's real estate market. The property market in 2019 could benefit from the potential increase in economic activity and property investments as Expo 2020 gets closer, bringing in more tourists and residents to the city. In order to increase level of transparency in Dubai’s property market in 2019 and as part of Dubai 10x initiative, Dubai land Department (DLD) announced last year Real Estate SELF Transaction (REST), a platform for conducting real estate trading and transactions with multiple parties anywhere and anytime. Although the effect of REST will be very minimal in 2019, however this initiative launched by DLD will increase transparency in Dubai’s real estate market and make the transaction process more investor friendly. 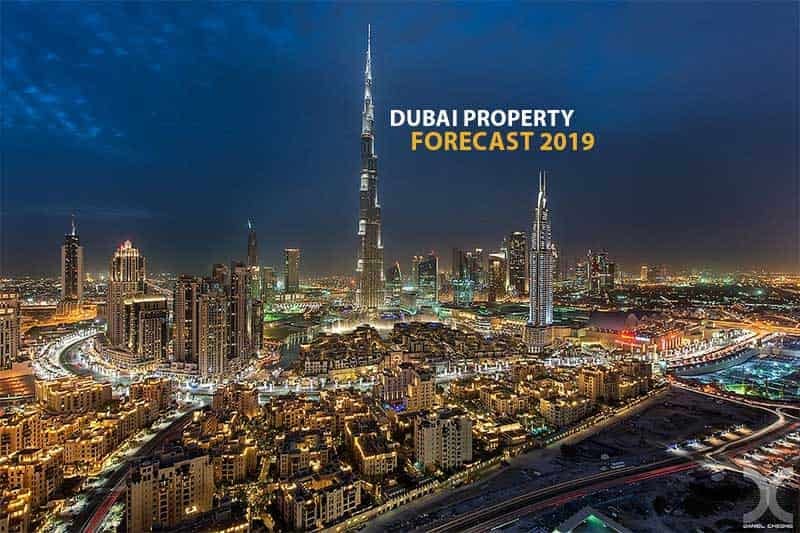 In conclusion, despite the slight media negativity from the start of 2019, real estate professionals and investors who understand Dubai’s market very well know 2019 will be a great opportunity to invest in Dubai real estate market, as this market remains to be the foundation of the city’s success and future, and will continue to generate success for buyers, investors and all those involved. Tell us below in the comment section what is your Dubai real estate forecast?, also if interested to learn more about Dubai's property market whether you want to purchase your dream house or rent an affordable property in a premium location, feel free to get in touch with one of Unique Properties expert agents by clicking on the “Book a meeting” button below or use the chat box to write us your enquiry.